Every job site is assigned a rating based on objective criteria to help you decide which job board is the right choice. Browsing Jobboard Finder is an easy way to find and compare job portals. Should recruiters be in need of further advice to complete their job board research, feel free to contact our team. 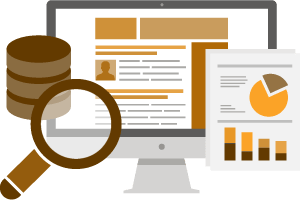 We believe it is our duty, as experts of the online recruitment market to share with you all of our knowledge , and even the most complex data. To give you even more support with your recruitment research we have scored each job board profile. A rating out of 10 appears in the results page and at the top of each job board profile. The score is automatically attributed without human intervention. What are our assessment criteria? The score for each job board is based on seven different criteria, made up of both an algorithmic/automatic cover and testing done by real people. 1/ The changes to the monthly audience: We calculate the audience (the number of visits) over the last three months from when you joined the Jobboard Finder thanks to our partner website SimilarWeb. The audience is calculated automatically each month by an API (application programming interface). Our algorithm determines the average audience over the last three months to provide a score, which takes into account the competition also referenced in our directory. To ensure the scoring is fair, the job boards are only compared to the same type of media category. E.g. : An IT niche job board will only be compared to other IT specialist job sites. It won’t be competing with professional social networks, aggregators or generalist job boards. 2/ The changes to the annual audience: We calculate the audience (the number of visits) over one year from when you joined the Jobboard Finder thanks to our partner website SimiarWeb. The audience is calculated over an entire year and our algorithm determines the average visibility, which provides a general idea of the progression and stability of the job board traffic. 3/ The user experience (both recruiters and jobseekers): In this particularly consequential part of our algorithm, testers from our Jobboard Finder team have manually tested our partner job boards by using them as a jobseeker and a recruiter. This allows us to experience firsthand how easy (or difficult) it is to find useful information and use the various tools. Our testers have then established an overall mark, which is based on (but is not limited to): the filters, the esthetic design, the language options, the transparency (clear information about the job board, for example), the reactivity, etc. 4/ The CV database: Recruiters usually appreciate this particular tool when sourcing candidates. Jobseekers are equality appreciative of a CV database because it means they don’t have to do the job searching alone. They can leave a CV and let recruiters come to them. 5/ The user mark (and opinion): It’s important for a comparator website like the Jobboard Finder to have reviews from job board users. Having jobseeker and recruiter opinions is an essential part of the algorithm to ensure the efficiency of our comparator. The scoring will take the number of job board reviews into consideration (the reviews are approved by the team to prevent any dishonesty or spam). 6/ HTTPS security: Now more than ever it is essential for a website to offer proper security to its users/visitors, especially if they register using personal details. If one of our partner job boards does not have an HTTPS protected site, it will be penalized by the algorithm. 7/ The job board page updates: Once you have joined our comparator and directory, the partner who has created the job board page is expected and encouraged to update the page when necessary (at least once every 6 months). This includes updates on the prices, the job offers, the audience, the description, etc. Our algorithm can detect which partners are the most active. These particular job boards will be rewarded with the highest mark for their regular efforts to keep us and their job board users updated. The scoring system is updated monthly. If one of the above criteria has changed in the last 30 days, the score is updated. A job board profile can get 10/10. If this is the case, whatever the cost, we assure you it is worth buying it! Our filter criteria are: a sufficient number of vacancies or candidates registered in the database, up-to-date information and job offers on the websites, as well as a professional customer service. We deliberately excluded non-professional job sites and websites where the employment section is only an additional or secondary service. The media selected by Jobboard Finder are requested to provide very detailed information. Many mandatory fields enable recruiters to conduct research on similar and objective criteria. All the information is then manually verified by our team including as the number of job listings and even the breakdown by function or sector. Audience figures and strategic information provided by job boards are carefully verified. We make sure the information is correct on the websites of their certification authorities, and ask for screenshots of their media data source etc. Then we can add the tag “All evidence provided allowed us to check this job board stats“ to their profile. A job board that does not supply enough guarantee in terms of reliable informaiton and exacitude will not be published in our index. Jobboard Finder is updated every day with new information or data. None of this data is automatically published: it is verified and moderated by our team. The whole process takes less than 24 hours.